Dutch Stammpot is a traditional winter dish made with seasonal mashed vegetables and smoked sausage. You can easily turn this into a vegetarian dish by omitting the sausage and using veg stock, it’s a satisfying meal either way. As many of our amazing readers know, my partner Craig is Dutch/French and his family is truly marvelous. His father Theo was gracious enough to share this recipe and told me to go ahead and tweak it. I did get a little carried away and added a lot of fresh vegs and the result is a richly satisfying bowl. Originating in the 1600s, stamppot is a traditional Dutch recipe that endures. Although you’ll find many variations, Dutch stamppot recipes typically use mashed potatoes as the base. And then incorporate a vegetable, which is usually kale, turnip greens, endive or sauerkraut. Get creative and add vegetables that you may have in your fridge already. Our recipe is a guideline and yields a delicious result, but you can easily adjust to use what you have on hand. One of the first Stamppots was Hutspot, hochepot, or hotchpot (meaning mix pot” which is a dish of boiled potatoes, carrots, and onions that are then mashed. Said to have originated after the Spanish soldiers fled, leaving behind stew that the starving Dutch welcomed after the “Eighty Years War”. Cut all of you vegetables in uniform size, which ensures an even cook. We used our Ham Hock Stock (pictured below) to add a deep layer of flavor to the mash, but you can easily substitute vegetable, chicken, beef stock or even water. 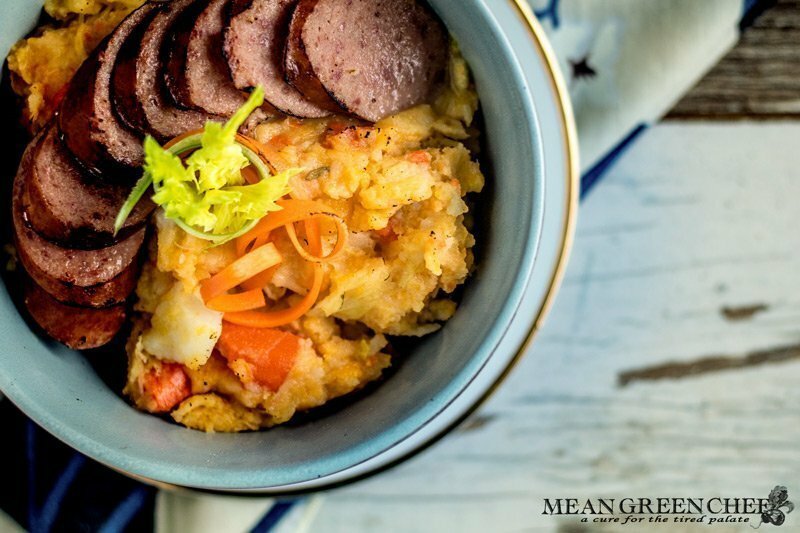 A traditional Dutch winter dish made with seasonal mashed vegetables and smoked sausage. You can easily turn this into a vegetarian dish by omitting the sausage and using veg stock, it's a satisfying meal either way. Peel and coarsely chop the potatoes, Butternut squash, sweet potatoes, carrots, parsnips, turnip, and onion. Wash the leeks and cabbage to remove any debris, then chop. Toss all into a large heavy-bottomed stock pot and then pour in the Ham Hock Stock, add water if need to bring the level up to barely cover the vegetables. Bring to a boil over medium-high heat, then reduce the heat and allow to simmer partially covered till vegetables are tender. About 20 minutes. Meanwhile, cook the smoked sausage until browned and cooked through. Drain the vegetables well, then mash, with the butter. Season with salt and pepper. Serve with sliced smoked sausage and a knob of butter if desired. Leftovers can be refrigerated in an airtight container up to 3 days. Freeze in an airtight container up to 6 months, freeze in individual portions. Grab our Ham Hock Stock Recipe to add to your cooking technique arsenal, and check out our other great comfort food recipes too!